In 1953, D.G. 's son Donald Donovan brought the family business to Manchester, NH and added Donovan Equipment Company to complement the Spring business at our former location on South Willow Street. 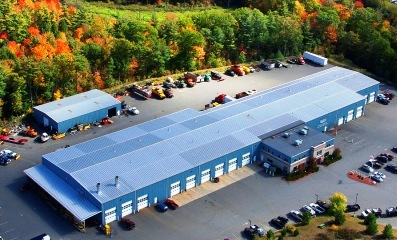 To better serve our customers and accomodate the growth of the businesses, a new facility was built in Londonderry, NH in 2002. The new 73,000 square foot facility features drive through bays, a walk-in parts showroom, two 44' DeVilbiss cross-draft paint booths and easy access off Exit 5 on Interstate 93-only 45 minutes North of Boston. As you browse our website, we hope you will get a glimpse of the comprehensive products and services Donovan Equipment and Donovan Spring have to offer. With over 75 years of experience, we know and understand the unique needs of our customers. When you walk into Donovan Equipment or Donovan Spring you can be confident that our employees have unparalleled industry experience and are knowledgeable about all makes and models of trucks. In fact, the majority of our employees have been with us for over 10 years and are ready to work with you in getting the most quality and value out of your truck equipment. Our goal is to do the best job in our industry so you can do the best in yours.